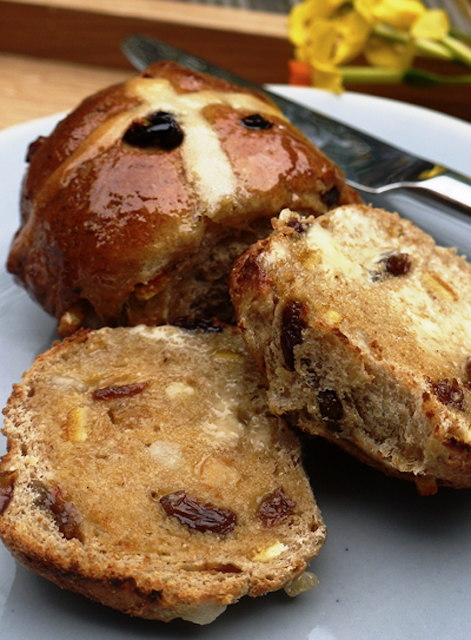 Hot cross buns are a rather old English tradition dating back to the Saxons who marked buns with a cross in honor of the goddess Eostre, the goddess of light, whose day of celebration eventually became Easter. It's thought the bun represented the moon, and the cross the moon's quarters. To Christians, the cross symbolizes the crucifixion. 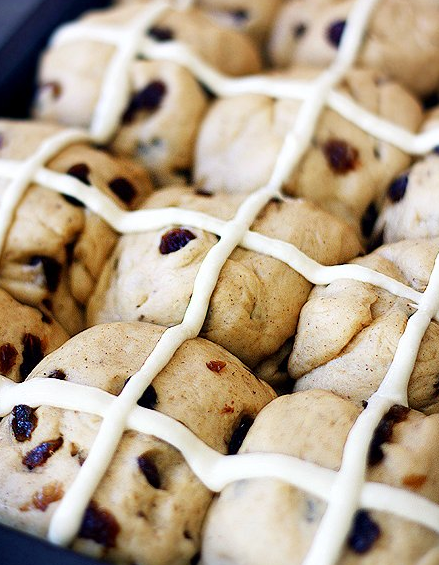 Hot Cross Buns are typically served on Good Friday, the Friday before Easter Sunday, although many enjoy these fragrant glazed fruit buns anytime during the year. Delicious toasted with a knob of butter, these homemade Hot Cross Buns take a little bit longer to prepare than buying them for your local bakery, but they're definitely worth the effort. In a bowl, whisk together the sugar, milk and yeast together until the sugar has dissolved. Cover and set aside for 10 minutes or until it becomes frothy. Mix the flour, salt, orange zest and ground spices in a large bowl. With your fingers, rub the butter into the flour until mixed and crumbly. Stir in the dried fruit, sultanas, eggs and frothy yeast mixture until combined. On a lightly floured surface, or in a mixer with a dough hook, knead the bread dough for about 5 minutes until it's smooth and elastic. If it's too dry, add a little more warm milk or water. Keep kneading until you have silky, elastic dough, but bear in mind that the dried fruit will stop it from being exactly satiny smooth. Lightly grease another large clean bowl with butter, place the dough in it and turn to coat the surface. Cover in clingwrap and leave in a warm, draught-free place for 45 minutes or even overnight, until the dough has doubled in size. When ready, remove the clingwrap and use your fist to punch down the dough. Give it a quick knead until smooth and divide into 12 equal pieces. Place the buns onto a parchment lined baking tray, cover with clingfilm and leave in warm place to rise for 15 minutes. Preheat the oven to 400°F. Brush the buns with an egg wash, and then mix the flour, sugar and water into a smooth, thick paste. Spoon the flour mixture into a piping bag and pipe a cross on top of each bun and bake at 400°F for 10 minutes. Reduce heat to 350°F and bake for another 15 minutes. The buns will be ready when they are pale golden-brown and sound hollow when you tap the tops. As soon as the buns come out of the oven, mix the sugar and boiling water together for the glaze. Brush them with the hot syrup to make them sweet and shiny, then set aside to cool on a wire rack. Serve warm or at room temperature with a knob of butter.